It pains me to say this, but David Rose has a reasonably decent piece in this week’s Mail on Sunday. So, instead of half-baked nonsense about climate science, we have something sensible about bio-energy. I find myself in the strange position of recommending that you read it. We’re a power company. We’ve been told to take coal out of the equation. What would you have us do – build a dirty great windfarm? Which gets me thinking. 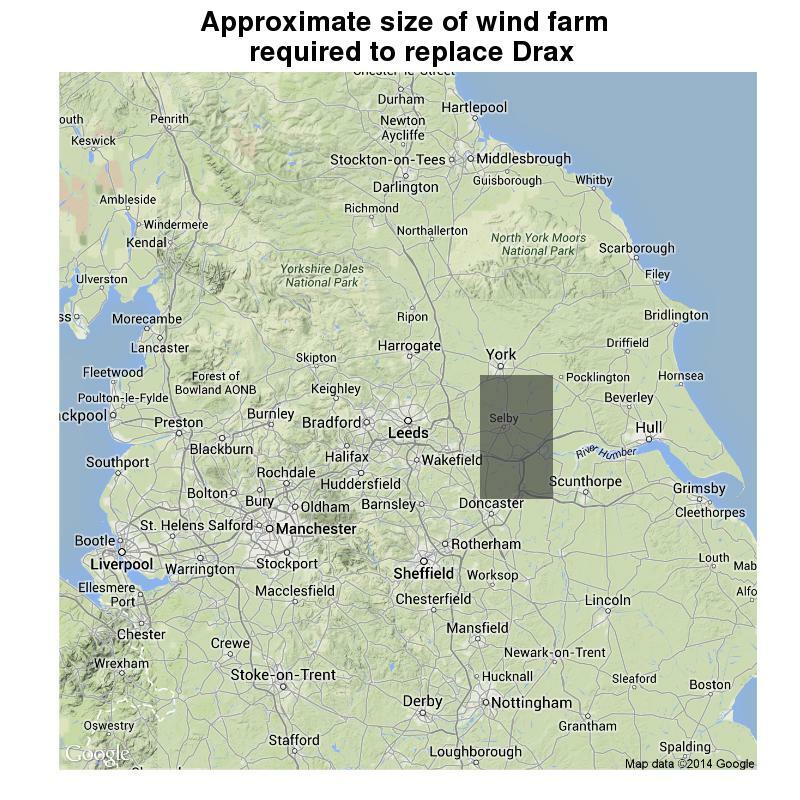 How big would a wind farm need to be to replace Drax? First, Drax has a total capacity of 3.96 GW and annual output of around 24 TWh. In other words the average output is about 2.7 GW. Second, David Mackay’s recent paper gives estimates of the power density of British wind farms. Based on his numbers 2.5 watts per square metre is a good upper bound on the power density of English wind farms, that is the average power output per square metre of wind farm. In reality it will be slightly less, but we’ll go with 2.5 for now. OK, not so good. Perhaps he has a point about that “dirty, great wind farm.” If you want to know why the UK is building wind farms in the North Sea, instead of building them on land this map tells you all you need to know. We simply have too little land, and too many NIMBYs. But what is his alternative? Yes, using biomass. So, basically we cut down a bunch of forest and convert the proceeds to wood chips. This is then shoved into a furnace and we get some electricity using a steam turbine. But how much land does that require? I said earlier that power density of an English wind farm would be something like 2.5 watts per square metre or less. Biomass however can proudly claim to be able to provide power densities of not much above 0.5 watts per square metre. (see Vaclav Smil’s, or David MacKay’s calculations.) And this is the power density of the energy provided by the biomass. You still need to run the stuff through a 40% or so efficient power plant. This is roughly one fifth of all forested land in the UK. And I should point out that I am being generous with my estimate of power density. You can probably multiple this area by two. 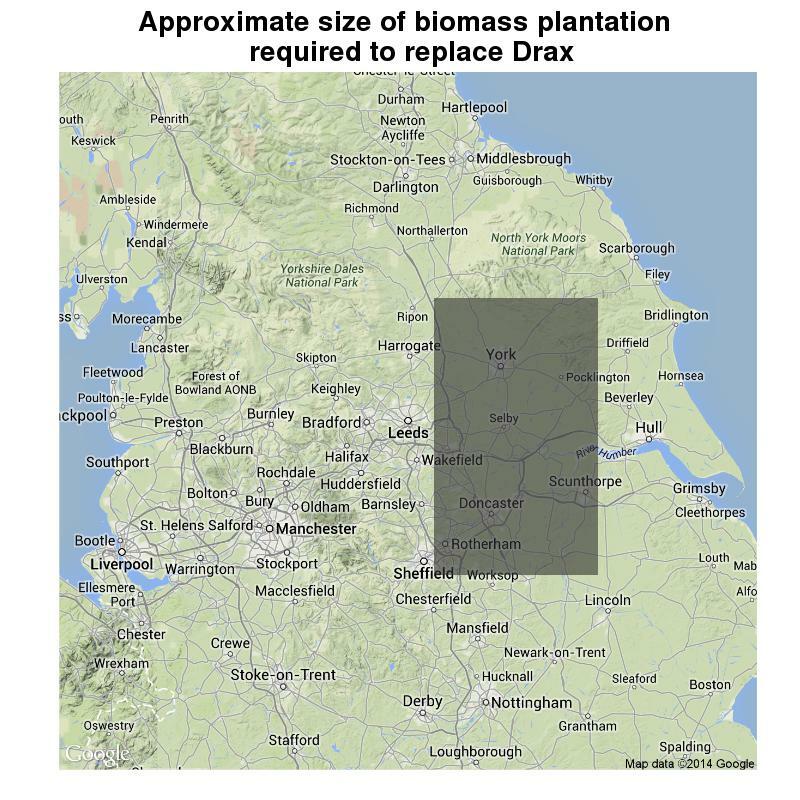 It is no surprise that Drax is simply importing almost all of its wood chips instead of converting vast areas of the UK over to biomass plantation. So, when a bio-energy PR person is complaining about things being dirty and great you probably should not listen to them. good response. When I attended Drax’s AGM last year, I had the pleasure of hearing the chairman say this in response to many mutterings from the floor about the riskiness of their biomass programme – “just because we are doing biomass doesn’t mean we don’t like coal”. From their rebuttal: http://www.backbiomass.co.uk/newsroom-story.php?id=358 . So – biomass is “one of the cheapest renewable fuels”, but it needs the highest subsidies. How does that work?? Worth noting it is that the UK “biomass” program is based on the liquidation of North American forests. What happens if and when the US and Canada take note of the devastation and come to their senses? Also worth noting are the estimates provided a couple of years ago by the Government in response to parliamentary questions aboutthe public health consequences of large-scale biomass. Could you provide a link to these estimates of public health consequences? I love your comparative energy density maps, a topic too often omitted from the discussion. And how much ENERGY does it take to harvest, transport, process (dry & chip), further transport across the Atlantic by diesel ship, then across the UK by diesel train. The area calculation also needs to take into account the re-growing time of the felled trees, which is probably 100 years. I presume the area calculation for the biomas map above is for 1 year’s consumption, so you have to multiply that by 100 to get the true figure. The area calculations do take this into account. Did you read the two calculations I linked to before telling me they don’t take it into account?